Let's keep it <$100, BUT don't cheap out on your friends! If you wouldn't put it on your bike, chances are they wouldn't. I'll start $49-Driven 3D grips! I plan to get them for a friend who wants the murdered out look for his 600RR. BROTIP: Check your credit card accounts! You may be surprised at the amount of rewards money you've accumulated over time. Engine LED Lighting Kit. 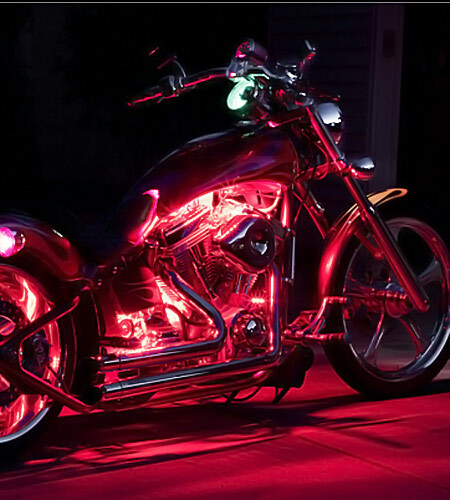 Been thinking about getting one myself to make my bike pop a little more at night.... and of course be seen!! R3 foot pegs ~$10 each. Yamaha part # 1WD-F7451-00-00 and part # 1WD-F7461-00-00. Here's a few things I've recently gotten for myself or looked into getting that would be great for motorcycle buddies or car buddies but also make everyday things a little easier on a bike or are just good things to have. These are not all motorcycle specific items but are useful gifts and all quality items that will last. 1. Free key system: a flat key ring that comes with a pack of 5 flat single key rings. The main ring has a raised portion. You press to easily get your keys on and off and has one more coil around to insure the keys do not come out. Secure and no more using nails to get those hard to spread apart rings open. Makes it much easier to get your motorcycle key off your key ring to stop the others from scratching your bike. 2. Tritium key fob: solar charged tritium key fob that glows. In the dark attaches to keys. Makes finding your motorcycle key in the dark a ton easier and charger with the sun for a glow time of up to 12 hrs. Chargers most phones up to 3 times and tablets 2 times. Has an added led light and aluminum shroud so pretty durable. I've had mine almost 6 months and works great. I would look around at several power bank options for different types needs as they come in several sizes and capacities. I got this on sale for 20 dollars a few months ago. I have this setup on my fz07 and recently rode 4 hrs going an average of 75 miles an hour high way over crappy back country highways with patchy roads and highway riding never had my phone move. Tether is added security. Note: you should by this from Amazon or revzilla as buying directly from ram. Mounts they want 16 dollars in shipping while amazon and revzilla will charge much less. If you have amazon prime you'll get free 2 day shipping and most prime orders are hassle free returns through Amazon. ^I use this as it raised the phone up higher for me to easily view directions with a glance versus moving my head away from the road. Comes in various lengths so shop around for your buddies needs. Phone bracket: XGrip Large: fits one plus one easily, as well as note 5, iPhone 6s and galaxy phones. Tether: just added security prevents movement in the xgrip in case of pot holes. 5. Oxford aquetex cover: cheap but effective. 6. Fuel bottle: Easy cheap and useful for long trips. 7. Hand forged slip joint non locking Japanese pocket knife: The uses are endless but these are quality knives hand made and are legal in every state if I'm not. Mistaken as they are non locking folding knives. City and county laws will vary. Everyone needs a knife. 8.trulite titanium flashlight: Great quality, low price, light weight, compact yet bright flashlight you can fit in your motorcycle jacket and not think about till you need it and it's there. With long run times and variable brightness. 9. Lightweight aluminum minimalist wallet: saves weight and space easy to use and carry cards and cash in your motorcycle gear without the added bulk of leather, can also be put in a front pocket as the size is much smaller than traditional. @motocr awesome add! I had no idea about oxford covers, especially the ones that have a solar charger! $7 - Crampbuster This was the only reason i could go on a 600 mile day trip without my wrists falling off. It works to so you can keep the throttle on but give your wrist and fingers a rest, and easily rotates out of the way when you dont need to use it. The solar panel ones I have not looked into much the only thing I'd worry about is if the panel supplied enough output on cloudy days if not I'd make sure I had one with a battery bank included but I do have 2 concerns with the covers with solar panel chargers. My concern with the solar panels is first and foremost the most efficient angle will be be based on you latitude and the sun altitude angle for the day/ month so getting that angle in the front of the bike is not always possible so the panels are not as efficient so I'd personally look at the ones with the panels not. In the front but on the sear or upward facing as they will work better and can be positioned correctly. The second concern is the power output and consistency. If it's cloudy will the panel still charge or try and trickle charge and how will this effect the battery life? I have not researched this much but it makes me a bit wary of these covers. Having said this it's a cool idea I'd recommend doing research on the panel chargers and battery charging based off these first. Speaking of solar panels here's another addition. Rav power 15w solar panel charger: could be used in combination with a power bank to always have power when you need it.